NAKURU COUNTY, Kenya, Aug 6 2014 (IPS) - Allan Karanja, 22, is a sand harvester. His job is a complex and arduous one that involves him working in deep pits, equipped only with a shovel, crowbar and no protective gear, as he mines sand. It’s also a deadly occupation. In Rhonda area, situated south of Nakuru town and next to Lake Nakuru National Park, in Kenya’s Rift Valley Region, is an area characterised by sprawling ramshackle settlements. Here hundreds of youth engage in sand mining, with the Ndarugu River, which flows into Lake Nakuru National Park, being the main site of sand harvesting. Karanja tells IPS he’s seen many of the workers around him die when weakened steep walls collapse in the midst of excavation. “Hunger is what drives us into these sand mines. We earn peanuts here despite the risks we undergo. We excavate sand without safety helmets,” Karanja says. In 2010, Nakuru town, situated 160 km north-west of Kenya’s capital city Nairobi, was voted by United Nations Human Settlements Programme or U.N.-Habitat as the fastest-growing town in East and Central Africa. The new title resulted in a rush of investors to the area and a subsequent boom in construction industry – the main consumers of sand. Rhonda is the leading source of sand in the entire Rift Valley Region, owing to its availability along the river bank. Here, sand mining dates back to the early 1980s. Jackson Kemboi is an owner of a two-hectare sand quarry where two sand harvesters died when a wall collapsed last month. A father and son died when a wall collapsed killing them on the spot, which prompted Kemboi to close temporarily. He tells IPS that sand mining in Rhonda provides employment to close to 3,000 people. “This quarry has been in existence since the early 1980s. We do not have the capacity to employ those excavating sand on a monthly salary basis since as the owner I have to share the amount earned per seven-tonne lorry with all involved. These young men come on daily basis, engage in scooping and loading of sand and get their wage at the end of the day,” Kemboi says. Kemboi says he charges Ksh. 5,000 (58 dollars) per seven-tonne truck of sand, with 20 percent of that sum being shared among sand miners, loaders and truck drivers as wages. Jack Omare, a father of two, tells IPS he has been working on Kemboi’s sand mine since 1992. He says he’s escaped death thrice. The worst incident, he says, was when weak sand walls collapsed, pushing him and the truck driver into the Ndarugu River. Luckily, they both survived. During the same month three others died when a wall collapsed in Kirinyaga of Meru County, Eastern Kenya. Omare says on a normal day he earns a minimum of Ksh. 300 (three dollars). It’s a meagre amount, just enough to provide a meal for him, his wife and children. But sand in Kenya is becoming a necessary component in fuelling the construction boom that is driving the rapid pace of urbanisation and rapid economic growth patterns in Kenya. The Kenya Economic Report 2013 by the Kenya Institute for Public Policy Research and Analysis predicted that the economy would grow by about 5.5 percent in 2013 and 6.3 percent in 2014, compared to 4.6 percent in 2012. Anne Waiguru, a cabinet secretary in the Ministry of Devolution and Planning, tells IPS that Kenya’s urban population is growing at four percent per annum. It’s a situation, she says, that can be attributed to Kenya’s 2008 post-election violence as well as youth migrating from rural to urban areas in search of jobs. But many of Kenya’s poor youth are turning to sand mining as a quick way of earning money, despite the deadly risks posed by collapsing mine walls due to poor sand harvesting methods. And Karanja is among many youth facing exploitation in the industry. According to Mary Muthoni, an official with local government child welfare, close to 3,000 youth, most of whom are under age, are involved in some of the worst forms of labour here, including sand mining. An official with Kenya’s Child Welfare Society, a government agency, tells IPS that youth engaged in mining are exposed to toxic materials, which increase their chances of developing respiratory diseases. Karanja says: “At 14, I would opt to miss classes at Kaptembwa primary school to go of loading sand into trucks to enable me purchase basic school items.” He quit school and did not even go to high school. 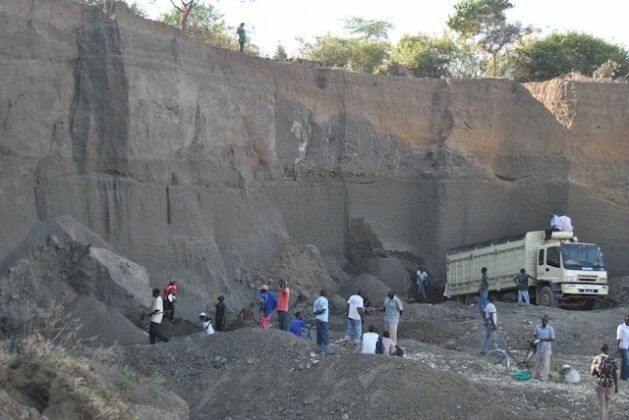 In 2013, the National Environmental Management Authority (NEMA) ordered the closure of all sand mines in Nakuru as it emerged that mining was contributing to environmental degradation. Sand mining in Nakuru, according to NEMA, has contributed to the siltation in River Ndarugu and also poses a threat to nearby public utilities and infrastructure such as roads and schools. “The ban remains active. As an authority, we have no problem with effecting the law but we are considering lives of thousands of the youth who would remain jobless,” Wilfred Osumo, Nakuru’s NEMA director, tells IPS. He says those who want to continue with the business, especially quarry owners, are required to apply for an environmental impact assessment license issued by NEMA at a cost of 0.1 percent of total project cost. NEMA’s 2007 National Sand Harvesting Guideline stipulates that sand harvesting or scooping is restricted to river beds with no harvesting allowed on riverbanks to avoid widening of rivers. “Sand harvesting in Rift Valley is done along the river beds, which is of poor quality as compared to earth sand mining in parts of Eastern Kenya namely Machakos, Kitui and Makueni,” Professor Jackson Kitetu, an environmental scientist specialising in sand harvesting research in Kabarak University, tells IPS. His research study between 1993 and 1997 revealed that sand harvesting in Eastern Kenya provided jobs to 30,000 people. And despite the risks associated with it, people will continue engaging in the industry. Mike Mwangi, a licensed driver on the sand mines, tells IPS that it is his preferred source of income despite the challenges. “I tried hawking fruits in the Nakuru town CBD but was frustrated by municipality officials. I had to quit and get back to this deadly job, sand harvesting,” he tells IPS.